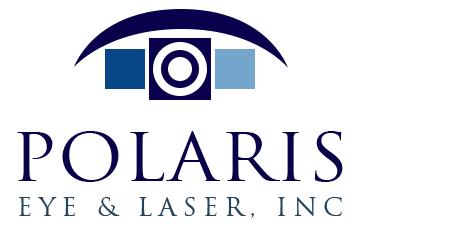 Having completed one additional year of elective fellowship training in cornea/external disease and refractive surgery, Dr. Kim has the experience and training necessary to treat the most complex corneal conditions. These include severe corneal ulcers, Fuchs’ corneal dystrophy, herpetic eye disease, iritis/uveitis, recurrent erosions, keratoconus, chemical injuries, and other severe anterior segment diseases requiring ocular surface reconstruction with amniotic membrane transplantation. A corneal ulcer is an open sore on the cornea, which is the transparent dome overlying the colored iris of the eye. A corneal ulcer usually results from an eye infection, though it can be caused by severe dry eye or other eye disorders. A white spot on the cornea that you may or may not be able to see when looking in the mirror. People who suffer injury or chemical burns to the cornea. Bacterial infections are common in contact lens wearers, especially in those using extended-wear lenses. Scratches, scrapes and cuts from fingernails, paper cuts, makeup brushes, and/or tree branches, can become infected by bacteria and lead to corneal ulcers. The virus that causes cold sores (the herpes simplex virus) may cause recurring attacks that are triggered by stress, an impaired immune system, or exposure to sunlight. Also, the virus that causes chicken pox and shingles (the varicella virus) can cause corneal ulcers. Improper use of contact lenses or steroid eye drops can lead to fungal infections, which in turn can cause corneal ulcers. Also, a corneal injury that results in plant material getting into the eye can lead to fungal keratitis. Acanthamoeba are microscopic, single-celled amoeba that can cause human infection. They are the most common amoebae in fresh water and soil. Acanthamoeba keratitis is particularly common in contact lens users, especially those who make their own homemade cleaning solutions. When acanthamoeba enters the eye it can cause severe infection. Bell's palsy and other eyelid disorders that prevent proper eyelid function. If the eyelid does not function properly, the cornea can dry out. Corneal ulcers and keratitis are commonly treated with anti-bacterial or anti-fungal eye drops. Sometimes antifungal tablets may be prescribed or an injection of medication is given near the eye for treatment. When the infection is well under control or gone, steroid or anti-inflammatory eye drops may be used to reduce swelling and to help prevent scarring. Steroid eye drops should only be used under close supervision by your cornea specialist. It is possible that steroid eye drops may worsen an infection. If corneal ulcers cause residual corneal scarring or thinning, corneal transplantation may be necessary to keep your vision. A corneal transplant can replace the damaged cornea with a healthy donor cornea to restore vision. If you think you have a corneal ulcer, it is important to see your cornea specialist immediately as early treatment may help reduce the risk of complications. Frequent visits to your ophthalmologist may be necessary to eliminate the infection. Fuchs' corneal dystrophy is an inherited condition that affects the delicate inner layer (endothelium) of the cornea, the transparent dome of layered cells overlying the colored iris of the eye. The endothelium functions as a pump mechanism, constantly removing fluids from the cornea to maintain its clarity. Patients gradually lose these endothelial cells as the Fuchs' corneal dystrophy progresses. Once lost, the endothelial cells do not grow back, but instead spread out to the fill empty spaces. The pump system becomes less efficient and the fluid starts to build up, causing the cornea to become swollen and cloudy, losing its crystal-clear transparency. Fuchs' dystrophy usually develops over two stages. Stage 1: In this early stage, the dystrophy may produce no symptoms or only mild symptom such as glare and light sensitivity. The vision may seem blurred in the morning and sharper later in the day because closing your eyes during sleep keeps moisture from evaporating out of the cornea. Swelling of the corneal cells occurs in the morning then tends to clear as the day progresses. Stage 2: Once the disease has progressed to Stage 2, vision no longer gets better later in the day. People with Stage 2 Fuchs' dystrophy may have pain and sensitivity to light. Extreme climate conditions such as high humidity can worsen the condition. Over time, some people with Stage 2 Fuchs' dystrophy develop scarring at the center of their cornea. The patient may become more comfortable once scarring is present, but the scar tissue over the cornea reduces vision. It can take 10 to 20 years or longer for Fuchs' dystrophy to progress from its early to late stage. If the end stage of Fuchs' dystrophy results in significant vision loss, your cornea specialist may recommend corneal transplant surgery, Penetrating Keratoplasty (PK) or Descemet's Stripping Automated Endothelial Keratoplasty (DSAEK) to restore vision. Fuchs' dystrophy is detected by examining the cornea with a slit lamp microscope that magnifies the endothelial cells. The health of the endothelium is evaluated and monitored by measuring the thickness of a cornea, known as pachymetry. Treatment of Fuchs' dystrophy will vary depending on the stage at which it was diagnosed. The frequency of follow-up visits to your doctor will also vary. Early stage Fuchs' dystrophy may involve annual visits, but more advanced cases or certain treatments may call for visits every few months or even more frequently. Fuchs' dystrophy cannot be cured, but certain medications control corneal swelling and resulting blurred vision. Salt solutions such as sodium chloride drops or ointment are often prescribed to draw fluid from the cornea and to reduce swelling. Because part of the underlying problem is the collection of fluid, your doctor may recommend treatments to help the extra water evaporate, such as exposure to warm, dry air (vents in a car or a blow dryer). In very advanced cases, corneal transplant or other surgical procedure may be advised. Herpes Simplex Keratitis: Herpes simplex is a virus that infects the skin, mucous membranes, and nerves. There are two major types of herpes simplex virus (HSV). Type I is the most common and is responsible for herpes simplex eye disease and the familiar "cold sore" or "fever blister." Type II is responsible for sexually transmitted herpes. The most common herpes simplex eye disease is an infection of the cornea, which can potentially lead to vision loss. Depending in part on which of several different strains of HSV type I caused the original infection, the infection varies in duration, severity, and response to treatment. Herpes simplex eye disease usually occurs in only one eye and HSV infection of the cornea rarely spreads to the other eye. Spreading the infection to another person is unlikely. It is important to remember that herpes simplex eye disease is not usually caused by HSV type II, the sexually transmitted herpes. Sexual transmission of herpes eye disease is extremely rare. The symptoms described above may not necessarily mean that you have herpes simplex keratitis. However, if you have a history of herpes simplex eye disease and experience one or more of these symptoms, contact your ophthalmologist for a complete exam. Antiviral eye medications are commonly used to treat herpes simplex and may need to be applied as frequently as one drop per hour. At times it may be necessary to scrape the surface of the cornea, to patch the eye, or to use a variety of medications. Medications can also be prescribed to help prevent recurrences of herpes eye infections. In case of severe scarring and vision loss, a corneal transplant may be required. It is very important to consult your ophthalmologist before beginning any treatment since some medications may worsen the disease. Herpes zoster, commonly known as "shingles," is a viral disease that causes a characteristic skin rash of small fluid-filled blisters (vesicles) which form scabs and can leave permanent scars. Varicella-zoster, the virus that causes chicken pox, is responsible for herpes zoster. Herpes zoster commonly attacks the nerves around the eye, especially the nerve that supplies the upper eyelid and forehead. If the virus affects the nerves that go directly to the eyeball, it can cause serious eye problems including corneal ulcers, inflammation, and glaucoma. These problems may appear at the same time as the skin rash, or weeks after the vesicles have disappeared. Injured sensory nerves may cause lingering pain and may be sensitive for years after the viral attack. The treatment involves control of pain and prevention of further skin infection with soaks, scrubs, and topical antibiotics. Antiviral medications and steroids taken by mouth may be helpful. Most people recover without complications. Unfortunately, some people have permanent visual damage and continue to have pain for years. Chronic pain after resolution of the initial rash may be treated with anti-depression and anti-epileptic medications. Uveitis means inflammation of the uvea, the middle layer of the eye. The uvea consists of three structures: the iris, the ciliary body, and the choroid. The iris is the colored structure surrounding the pupil, visible in the front of the eye. The ciliary body is a structure containing muscle and is located behind the iris; it is responsible for focusing the lens. The choroid is a layer containing blood vessels that line the back of the eye and is located between the inner visually sensitive layer, called the retina, and the outer white eyewall, called the sclera. Inflammation occurring in any of these three structures is termed uveitis. Uveitis may develop from eye trauma or surgery, in association with diseases which affect other organs in the body, or may be a condition isolated to the eye itself. Severe and permanent visual loss can result from uveitis. In addition, uveitis can lead to other ocular complications, which may produce vision loss, such as glaucoma, cataracts, or retinal damage. Early detection and treatment is necessary to reduce the risk of permanent vision loss. Depending on which part of the eye is inflamed in uveitis, different combinations of these symptoms may be present. Treatment may include steroid eye drops, injections, or pills, as well as eye drops to dilate the pupil and reduce pain. Severe uveitis may even require treatment with chemotherapeutic agents to suppress the immune system. Keratoconus is a degenerative disease of the cornea that causes it to gradually thin and bulge into a cone-like shape. This shape prevents light from focusing precisely on the retina. As the disease progresses, the cone becomes more pronounced, causing vision to become blurred and distorted. Because of the cornea's irregular shape, patients with keratoconus are usually very nearsighted and have a high degree of astigmatism that is not correctable with glasses. Keratoconus is sometimes an inherited problem that usually occurs in both eyes. However, one eye is often worse than the other. Keratoconus is usually diagnosed when patients reach their twenties. For some, it may advance over several decades, for others, the progression may reach a certain point and stop. Keratoconus is not usually visible to the naked eye until the later stages of the disease. In severe cases, the cone shape is visible to an observer when the patient looks down while the upper lid is lifted. When looking down, the lower lid is no longer shaped like an arc, but bows outward around the pointed cornea. This is called Munson's sign. Special corneal testing called topography provides the doctor with detail about the cornea's shape and is used to detect and monitor the progression of the disease. A pachymeter may also be used to measure the thickness of the cornea. The first line of treatment for patients with keratoconus is to fit rigid gas permeable (RGP) contact lenses. Because this type of contact is not flexible, it creates a smooth, evenly shaped surface to see through. However, because of the cornea's irregular shape, these lenses can be very challenging to fit. This process often requires a great deal of time and patience. When vision deteriorates to the point that contact lenses no longer provide satisfactory vision, corneal transplant may be necessary to replace the diseased cornea with a healthy one. Recurrent corneal erosion is a condition affecting the outermost layer of corneal cells called the epithelium. This problem is caused when the bottom layer of epithelial cells adhere poorly to the cornea, causing them to slough off easily. Pain and discomfort is often quite intense, similar to a corneal abrasion. There is usually an underlying disorder that causes recurrent corneal erosions. The most common are: previous corneal injury (corneal abrasion), corneal dystrophy such as Map-Dot-Fingerprint Dystrophy, or corneal disease resulting in recurrent breakdown of the epithelial cells. Upon awakening from sleeping, patients often experience severe pain, blurred vision, and light sensitivity when the eyelid pulls the loosened epithelial cells off the cornea. After the cornea heals, the problem recurs unless the condition is properly treated. Recurrent corneal erosion may affect one or both eyes, depending on the underlying cause. Using a slit lamp microscope, the doctor examines the corneal layers under high magnification. 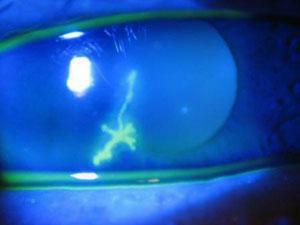 Eye drops containing green dye called fluorescein stain the areas of missing epithelium, allowing the doctor to evaluate the size and depth of the erosion. Salt solution drops or ointments are usually prescribed as the first line of treatment. This medication helps the epithelium to adhere better to Bowman's layer of the cornea. Sometimes, a soft or bandage-type contact lens is used to facilitate healing. Artificial tears are also recommended to keep the cornea moist. Those with underlying corneal dystrophy may require additional treatment. This usually includes an in-office procedure where microscopic punctures are made on the cornea to encourage epithelial cells to bond securely to Bowman's layer underneath. Patients who continue to suffer from recurrent corneal erosions despite standard treatments, may benefit from phototherapeutic keratectomy (PTK). This involves removal of the superficial layer of corneal cells using the Excimer laser to encourage proper healing.